I am always looking for new salads to try to take to summer barbecues and family birthday parties. 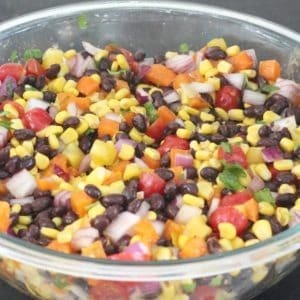 Potato salads and pasta salads are always a hit, but I was looking for something new and decided to try this easy southwestern black bean and corn salad. This salad is really easy to make. It’s very healthy too, much healthier than potato salad! It has lots of flavor. Your friends will definitely be asking you for the recipe. Note: In place of the cumin, you can stir in a packet of taco seasoning instead if you want to give the salad a taco flavor. 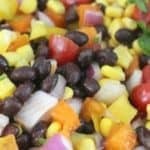 This salad can be served immediately or refrigerated and served later. It still tastes great after several days in the refrigerator.